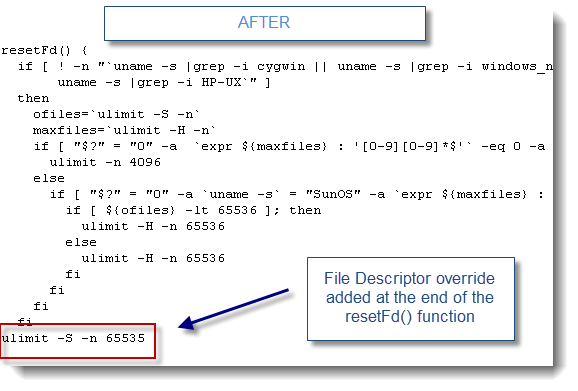 This case study describes the complete root cause analysis and resolution of a File Descriptor (Too many open files) related problem that we faced following a migration from Oracle ALSB 2.6 running on Solaris OS to Oracle OSB 11g running on AIX. This article will also provide you with proper AIX OS commands you can use to troubleshoot and validate the File Descriptor configuration of your Java VM process. This error indicates that our Java VM process was running out of File Descriptor. This is a severe condition that will affect the whole Java VM process and cause Weblogic to close its internal Server Socket port (HTTP/HTTPS port) preventing any further inbound & outbound communication to the affected managed server(s). File Descriptor – Why so important for an Oracle OSB environment? The File Descriptor capacity is quite important for your Java VM process. The key concept you must understand is that File Descriptors are not only required for pure File Handles but also for inbound and outbound Socket communication. Each new Java Socket created to (inbound) or from (outound) your Java VM by Weblogic kernel Socket Muxer requires a File Descriptor allocation at the OS level. An Oracle OSB environment can require a significant number of Sockets depending how much inbound load it receives and how much outbound connections (Java Sockets) it has to create in order to send and receive data from external / downstream systems (System End Points). For that reason, you must ensure that you allocate enough File Descriptors / Sockets to your Java VM process in order to support your daily load; including problematic scenarios such as sudden slowdown of external systems which typically increase the demand on the File Descriptor allocation. As you can see, the current capacity was found at 2000; which is quite low for a medium size Oracle OSB environment. The average utilization under heavy load was also found to be quite close to the upper limit of 2000. Root cause: File Descriptor override only working for Solaris OS! 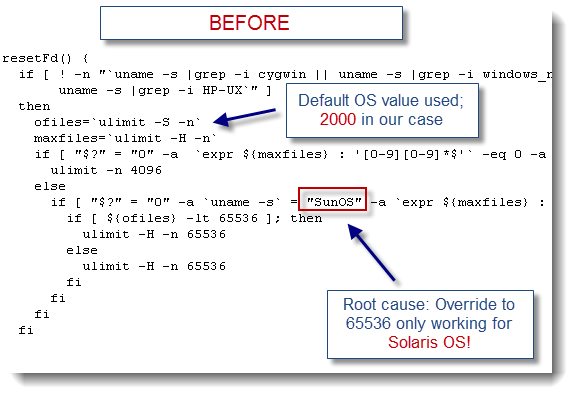 As you can see with the script screenshot below, the override of the File Descriptor limit via ulimit is only applicable for Solaris OS (SunOS) which explains why our current OSB Java VM running on AIX OS did end up with the default value of 2000 vs. our older ALSB 2.6 environment running on Solaris OS which had a File Descriptor limit of 65536. No failure has been observed since then. - From a capacity planning perspective, please ensure that you monitor your File Descriptor utilizaiton on a regular basis in order to identify any potential capacity problem, Socket leak etc.. Please don’t hesitate to post any comment or question on this subject if you need any additional help.